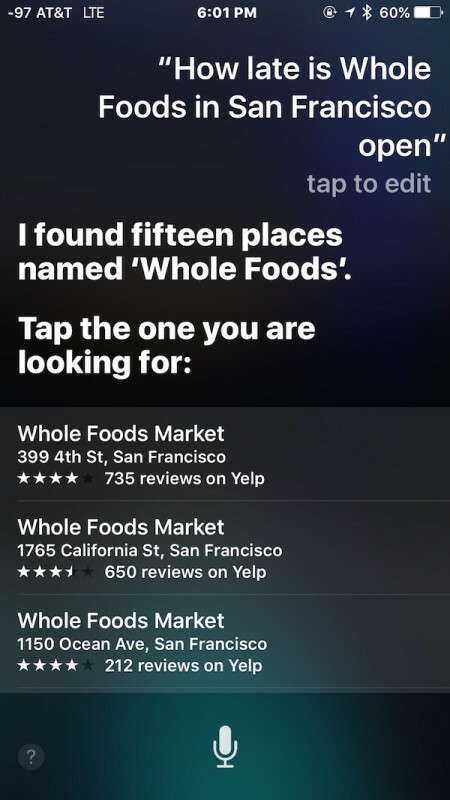 If you’ve ever needed to know how late a particular store or restaurant is open, just pull out your iPhone and ask Siri. This should in handy when you’re out and about running errands or need to make a last minute shopping stop, but it’s clearly useful for many purposes. And if you have a new iPhone with Hey Siri enabled for hands free queries, it works great in the car or when you’re out walking around too. 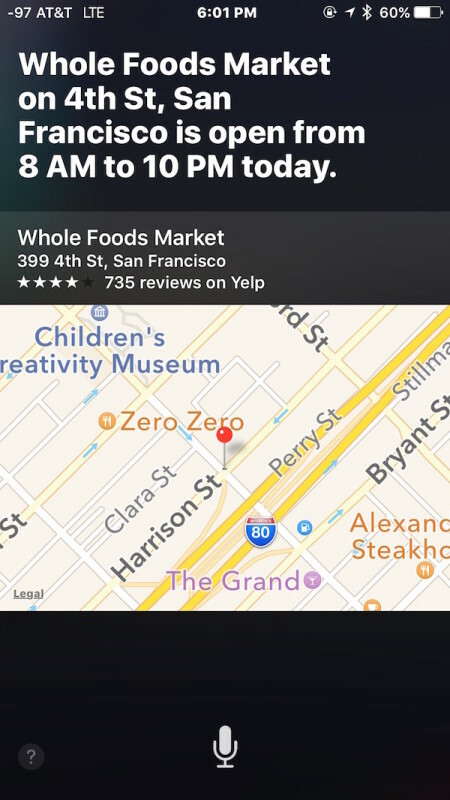 As usual with Siri, the secret is simply in asking the right question, but as long as the business, restaurant, or store is listed and Apple Maps can find it, the store hours will be able to be retrieved. How late is [store name] open? How late is [restaurant name] open? 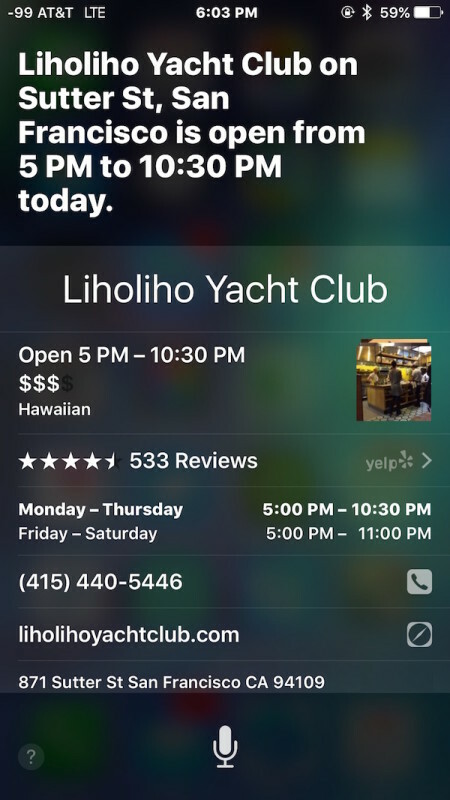 Siri will respond with the hours, showing them on screen and also announcing them aloud (unless you muted Siri). You’ll notice the listings open and closing hours are shown, as well as a phone number, map, and other details about the location. Missing currently however is whether the location accepts Apple Pay, but you can check that with the Apple Maps application by tapping on the little map from the Siri return if you’re curious. Note that if you ask for a store or business with many locations nearby, aim to be specific about the location by specifying a street with it, otherwise you’ll get a listing to tap on, which takes away from the hands-free effect. Obviously we’re focusing on iPhone here, but yes of course this works on the iPad and iPod touch with Siri as well, but since most of us carry the iPhone around it’s a bit more relevant for shoppers. Siri continuously gains new abilities, but you can see an enormous list of Siri commands here if you’re just getting started with the virtual assistant. That’s a really nice feature. I could see myself using this all the time while driving. Unfortunately it relies on Apple maps business data which is not as complete as Google maps business data. The Maps app on my phone does the same thing, without Siri. more than half the time SIRI comes up with the strangest answers, as though she was from Mars & can’t understsnd English, what a waste. Google search is 100 times better. finally, either improve SIRI or, get rid of this feature.